Do you have a home based business or make a craft type item? 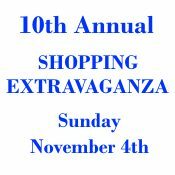 Then our craft show is the perfect place for you to participate in our 10th annual shopping extravaganza event on Sunday, Nov 4th from 9-3pm. Cost for the booth ranges from $50-$25 depending on location selected. For more information and an application call Kim Nemeth at 716-773-3331, 481-3746 or email her at kimneme@gmail.com. It is not too late to purchase a booth. Refer a friend! Come have fun, meet new people and sell your items! 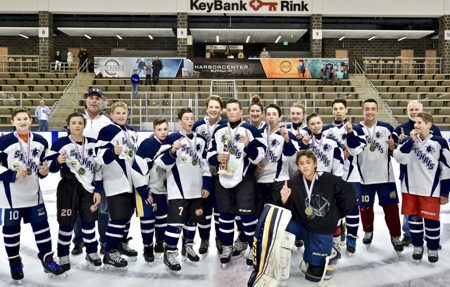 On Friday, June 8th, the combined Catholic Middle School Varsity hockey team of St. Stephens of Grand Island and St. Christophers of Tonwanda won the Division Championship game with a final score of 8-4 over St. Peter and Paul Catholic Middle School of Hamburg. St. Stephens/St. Christopher went 10 & 0 for the season to achieve the Buffalo Catholic Middle School Varsity Division Championship. St. Stephen's school and Grand Islanders Brandon Barone 8th grade, Chance Luthringer 8th grade, Carter Heacock 8th Grade, and Tristan Gipp, 7th grade, assisted the team in the 8-4 Championship game win and shut out season. 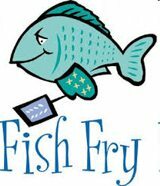 St. Stephen School of Grand Island will host its famous Lenten Fish Fry Dinners each Friday, from February 16th through March 30th. Come join us for a great meal. This delicious, family friendly tradition has continued for over three and a half decades! Dinners will be served from 4:30pm - 7pm in the school cafeteria (2080 Baseline Road, Grand Island, NY, 14072). Take-Out orders will be taken by phone at (716) 773-4347 from 3:30 to 7pm. On March 30th (Good Friday), dinners will be available for Take-Out only (no Dine-In). See flyer for details. (February 1, 2018)...New York State Department of Environmental Conservation (DEC) Region 9 Director Abby Snyder today announced the winner of Western New York's 9th Annual Arbor Day Poster Contest for fifth graders - Jaden Campbell from Saint Stephen School in Grand Island, NY. The theme for 2018's contest was "Trees for Bees." Fifth grade students from across the state were asked to create an original poster depicting this theme for the statewide contest. 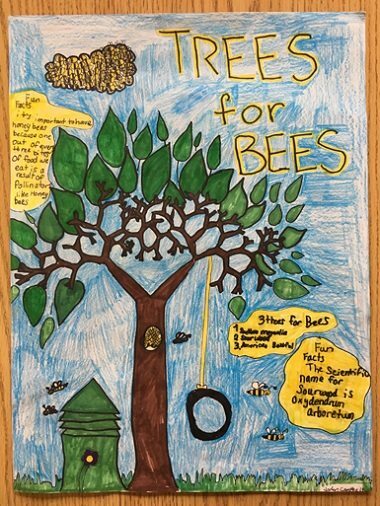 "Jaden's exceptional artwork captured the importance of bees and other pollinators in our lives and the role that trees have in creating healthy ecosystems to support those pollinators," said Patrick Marren, DEC Region 9 Supervising Forester. Jaden's winning submission will be sent to Albany to be judged with other student winners selected from each of DEC's nine regions. Winning artwork from the statewide contest will be used as the official 2018 New York State Arbor Day Poster and distributed at schools, libraries, government offices, nursery and landscaping businesses, and environmental organizations statewide. The poster selected to represent Region 9 in the statewide contest is chosen each year by Western New York ReLeaf, a group of volunteers from the region's community of forest professionals, not-for-profit groups, and government organizations interested in the benefits of urban forests. Western New York ReLeaf will donate a tree to Jaden Campbell's winning school in Grand Island for hosting this contest for fifth graders. *A farm-to-table culinary program includes class gardens and a large greenhouse (which doubles as an outdoor classroom), weekly cooking classes for grades 1-8, and preparation of fresh vegetables and other dishes to complement the lunch program. * Enhanced courses in math, science and language arts make graduates eligible for advanced placement in both Catholic and public high schools, opening the way for students eventually to earn college credits while still in high school. These courses are supported by full-time math and reading specialists. Additionally, the PreK-8 Spanish program prepares students for placement in Spanish 2 in area high schools. *Academic technology includes interactive TV panels for grades 6-8, iPads for all grades, and a new set of state grant-funded Chromebooks for grades 6-8. *Comprehensive emphasis on student safety includes a camera-driven security system, CPR and AED certification by all teachers, and police training on lockdown/lockout procedures. The school also has a nurse-staffed health room. *St. Stephen's has its own school bus, which every day picks up and returns students to Niagara Falls. It also is used for a variety of field trips. * Other features of the school include 21 extracurricular student clubs such as art, beekeeping, hockey, mission, handball and sign language; a robotics program; competitive and intermural sports activities including swimming, baseball, basketball, tennis, track and soccer; and choral and instrumental music programs. Addressing an issue many prospective parents ask, Gruenauer explained that St. Stephen's does not participate in New York State common core testing. Instead, it uses the STAR math and language arts test to benchmark and monitor student progress. Focusing on the issue of academic achievement, the principal noted that all teachers are certified. Teachers have earned various awards, including Grand Island Teacher of the Year. The school is accredited by the Middle State Association of Colleges and Universities. For additional information, contact St. Stephen School at 716 773-4347.